We’d love your help. Let us know what’s wrong with this preview of Walking the Somme by Paul Reed. 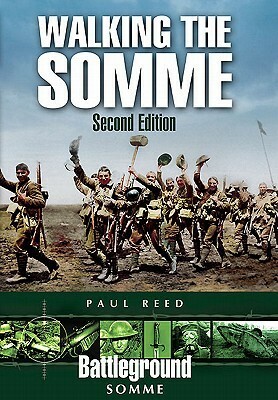 This new edition of Paul Reed s classic book Walking the Somme is an essential traveling companion for anyone visiting the Somme battlefields of 1916. His book, first published over ten years ago, is the result of a lifetime s research into the battle and the landscape over which it was fought. From Gommecourt, Serre, Beaumont-Hamel and Thiepval to Montauban, High Wood, De This new edition of Paul Reed s classic book Walking the Somme is an essential traveling companion for anyone visiting the Somme battlefields of 1916. His book, first published over ten years ago, is the result of a lifetime s research into the battle and the landscape over which it was fought. To ask other readers questions about Walking the Somme, please sign up. He was born Paul Hustoft to Sigurd William and Melva Hustoft in San Diego, California on May 28, 1956. Reed, whose biological father died when he was five months old, also had a sister, Karen Hustoft, and a stepfather, who was a Baptist preacher. Reed legally changed his last name in 1969. As a child and adolescent, Reed studied the organ and harpsichord, and as an adult, he obtained a B. A. in Soc He was born Paul Hustoft to Sigurd William and Melva Hustoft in San Diego, California on May 28, 1956. Reed, whose biological father died when he was five months old, also had a sister, Karen Hustoft, and a stepfather, who was a Baptist preacher. Reed legally changed his last name in 1969. As a child and adolescent, Reed studied the organ and harpsichord, and as an adult, he obtained a B. A. in Sociology from California State University, Chico in 1978 and an M. A. in Social Anthropology from the University of California at Davis in 1981. Reed attended his first gay pride parade in San Francisco in 1980, and moved to the city in July 1981. He remained in the Bay area for the remainder of his life. Reed's move to San Francisco occurred one month after the Centers for Disease Control published "Pneumocystis Pneumonia: Los Angeles" in Morbidity and Mortality Weekly Report, the report that introduced the medical world to what would become known as AIDS. Reed entered the Castro gay urban subculture as post-Stonewall gay liberation zeal gave way to the sobering realities of the AIDS epidemic. The sense of this change is reflected in his somewhat autobiographical novel Longing (1988), which narrates its protagonist's similar move to San Francisco. The specter of the epidemic looms within the novel and, indeed, permeates all of Reed's writing. This consciousness is a direct result of Reed's life experiences, for in addition to writing during the emergence of the HIV virus, Reed also survived the transformation of AIDS from an acute to a chronic condition. Reed claims in The Redwood Diary: A Journal (1995) to have known he had AIDS at least as early as 1981. Reed's understanding may well be retrospective, however, since AIDS was not named until midyear 1982; nonetheless, Reed HIV-seroconverted during the early years of the epidemic. Surviving until 2002, Reed lived to witness and benefit from progressive advances in antiretroviral therapies. More specifically, when Reed's T-cell count dropped to 120 in late 1987, he benefited from the Federal Drug Administration's approval of AZT, the reverse transcriptase inhibitor he credited for his recovery. Similarly, when Reed's viral load (the amount of HIV in the bloodstream) rose to an incredible 1.1 million in early 1996, his health was restored through the use of Saquinavir, the first protease inhibitor to receive FDA approval in 1995. In addition to being a person living with AIDS, Reed participated in experimental HIV treatments, such as the Compound Q trials, which he recorded in his diary The Q Journal (1991). Reed also experienced the waves of AIDS bereavement common to the early years of the pandemic, having lost his lover Tom in 1990 and several acquaintances, peers, and friends--notably his intimate long-term friend Cap in 1996. This personal history and epidemiological context informs all of Reed's writings, as they document the changes and challenges facing a writer living with AIDS.